I remember a time about twenty years ago when many rock bands still had something to say, unlike today where it is deemed better to just shut your mind and numbing the audience’s brains with nondescript lyrics. 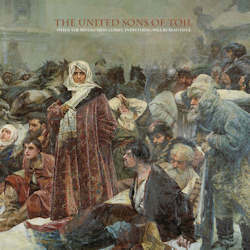 The United Sons Of Toil, of three-piece from Wisconsin, are one of the few bands of today that have a clear message. In their case, it’s all about anarcho-syndicalism, anti-imperialism and socialism, in order to raise people’s awareness of the dangers of current neoliberal pseudo-democracies and the manipulation of the media. This may all sound very naïve, but let’s face it, if nobody dares or cares to take a stand, things will go worse for a long time to come. In line with their political ideologies, you therefore can either buy or freely download this third album, titled When The Revolution Comes, Everything Will Be Beautiful. Cynics will probably claim that the band’s music is as dated as their philosophies, but I tend to believe that neither good music nor uplifting ideas will ever be out of fashion. The United Sons Of Toil are deeply inspired by the noise rock movement of the early Nineties, and they openly list the era’s leading indie labels (Touch And Go, AmRep, Dischord) among their influences. This should already tell you what to expect: loud distorted guitars, prominent bass lines, fierce drumming and hoarse shouted vocals. In fact you get everything here that the pioneering bands from way back then (Shellac, Fugazi, Jesus Lizard,…) did, and if you told me that When The Revolution Comes, Everything Will Be Beautiful had been released twenty years ago, I could have easily believed you. So this makes for maybe not very original music, but the band is smart enough to bring enough variety into their music. Their songs occasionally make it over five minutes, and it’s especially on their longer material where they find the room for more atmospheric moments. In that way, The United Sons Of Toil are far away from being just formulaic retro lovers, instead are determined to come up with some really engaging songs. Add to this the lyrics sheet with extensive elaborations about the songs’ meanings, and you have not only a really good album, but also an enlightening history lesson in your hands. If only more bands today had the guts to really say something with their music!